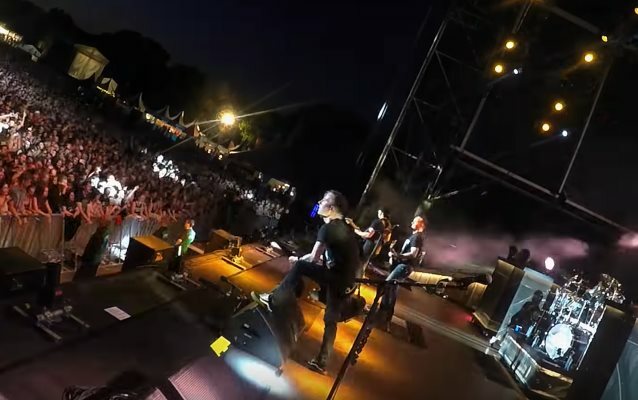 Professionally filmed video footage of Danish/American rock 'n' rollers VOLBEAT performing their song "Seal The Deal" this past June at the FortaRock festival at Goffertpark in Nijmegen, the Netherlands can be seen below. The track is taken from the band's sixth full-length album, "Seal The Deal & Let's Boogie", which was released on June 3 via Republic Records. VOLBEAT guitarist Rob Caggiano told TeamRock about the "Seal The Deal" track: "We already had the album title before we wrote this song, and as is the case with all these songs, they came together musically before we had any lyrics. But this song, to me, very much has the spirit of MOTÖRHEAD in it." He continued: "We were originally talking about covering a MOTÖRHEAD song in tribute to Lemmy, but when [drummer] Brandon [Carlisle] from TEENAGE BOTTLEROCKET passed away, that kind of changed our plan. So we made the title track a kind of indirect tribute to Lemmy and MOTÖRHEAD." VOLBEAT frontman Michael Poulsen explained the story behind the "Seal The Deal & Let's Boogie" album title. He said: "When I write, I'm pretty much locked into this bubble. And sometimes when I come out, I have no idea where I've been or where I got the idea from. And going back to where I came up with the title, I really don't remember. I think it popped up when I was writing the song called 'Seal The Deal' and things just popped up improvising, and I said, 'Well…that sounds pretty good.' And I pretty much used that title on every song somehow, because you can analyze the title in many different directions. So I think I came up with the title when I was writing the song 'Seal The Deal'." Asked how VOLBEAT deals with the fact that fans sometimes worry that each new album from the band is going to be softer than the previous one, Michael told Studio Brussel: "We don't. [Laughs] We do what we do, and we love what we're doing. And we're just progressing as a band. Sometimes people think the next record is too heavy or too soft. It depends on which ears are listening to it. We don't care too much about it. We are VOLBEAT and we found our signature sound and style on the first record. And there's a lot of new songs that could be on the first record, but then again, we're also progressing as a band, so maybe some of the songs are a little bit more soft, but there will always be metal influences and… We don't care too much about it. We just like to write songs and be on the road. We would never like to be on the road if we didn't care about what we were doing. So who knows? Maybe the next record will be an extreme metal album. It really depends on where you are when you sit down and write. So we don't think too much about it."